I’ve mentioned before that I’m a creature of the seasons, and with my favorite time of year upon us, I’ve been finding (making) time to break out the colored pencil set! Between the foliage, harvest vegetables and colorful clothing, fall is a beautiful time of year. And if you’re an artist, it can be especially inspiring. Despite still being overwhelmingly busy with home renovations, I’ve been making art a priority the last few weeks, and have been taking advantage of even the smallest available windows of “free” time. While these small chunks of time don’t allow for elaborate pieces, I’ve found that I am quite content completing small sketches, inspired by the season. Completed art doesn’t have to be elaborate for an artist to get their fix. Using these small windows of time, I’m seeking to capture that which I love most about this time of year before it passes by. I love natural elements (such as the pumpkin above) but I’m also obsessed with fall fashion. I love the colors that the season brings out in fashion and am always drawn to the idea of cozying up in oversized clothes (see my latest post on hygge). Then there are the textured sweaters, plaid scarves and (my all-time favorite) boots! I’m so incredibly thankful that our home projects have just about come to a close and I’ll soon be able to enjoy this season to its fullest. Whether its through fashion, pumpkin spice lattes or hygge, I hope everyone out there is enjoying nature’s most magical time of year! Stay tuned for more fall-inspired artwork and new recipes to come! Although the series is associated with Scotland, the French setting has provided for some phenomenal visual feats. I find the set to be authentic and captivating, but more than anything else this season, I have been enraptured by the costuming. When I was younger, I possessed a far-away fantasy of one day becoming a fashion designer. I was never serious about this pursuit, but always enjoyed drawing clothes. Although my interest began in high school, I was further inspired in undergrad when I was exposed to fiber art. I instantly fell in love with the medium, having found a way to utilize fabric and other fibrous materials artistically without becoming a designer. It was during my surface design course, and later weaving pursuit, that I didn’t spend a lot of time drawing clothing but instead, sewing, weaving and embroidering art. I even painted a series of odd costumes, with the painted clothing constructed of materials other than fabric fabric. Therefore, it has been quite a while since I have tried my hand at fashion-drawing. Inspired by “Outlander,” I decided to tackle the clothing of an era I had yet to try: Eighteenth Century, France. 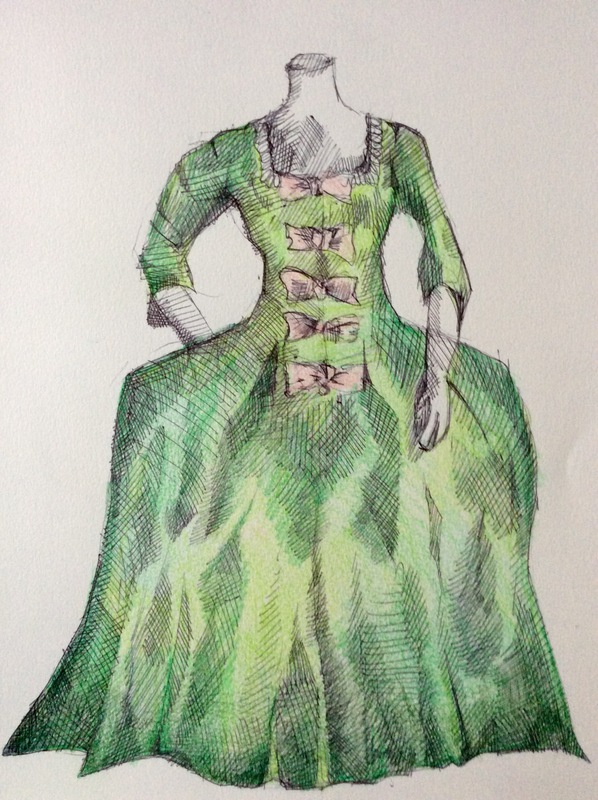 While the drawing featured below is not based on a costume from the show, the era and country were obviously direct inspiration. As the season proceeds, I can only hope that we continue to witness fabulous historic costuming. Realistically though, I happen to think we will be returning to Scotland sooner rather than later. Dinna fash though, no spoilers here!